ELECTROPLATED DIAMOND ID GRINDING DRUMS (New / Re-coating) We manufacture brake lining internal grinding drums and rollers of various size ranging from 150 mm to 600 dia and length from 50mm to 300mm with parallelogram segments on surface, Electroplated with 30/40 grit natural diamond powder is used approximately at 3000 RPM for internal grinding of brake pads can be supplied. 406 mm and 410 mm dia drums with segment are normally used by customers. Smaller dia drums with 300 mm dia are also used depending upon the curvature of the brake linings. 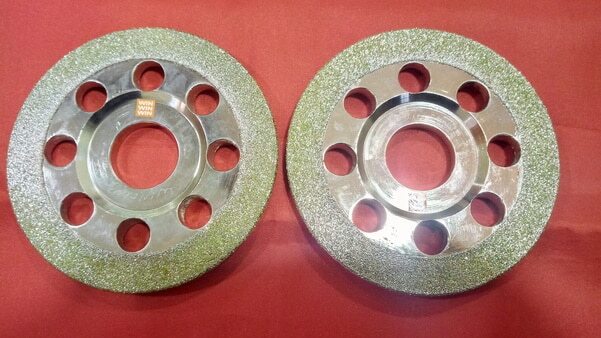 ELECTROPLATED DIAMOND WHEEL 1. Electroplated Diamond Wheels ranging from Dia 50mm to Dia 800mm with Plain and Segmented Type As per Customer Specification. These wheels are used in Brake Lining, Asbestos, Fiber and Reinforced Plastics, Hard Plastics Carbon etc., also suitable for Sawing and Slitting Tungsten Carbide, Ceramics, Quartz, Glass Acrylic, Bakelite, Seated Moluded Components in Electrical Insulators etc. Segment Wheels are normally recommended for reducing wastage of costly material. Burr Relieving Strips ensure Smooth Surface Finish of the Cutting Surface Grit Size will be chosen depending on the nature and thickness of the Cutting Materials.